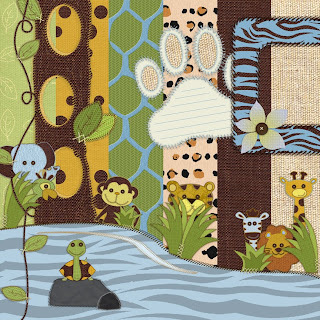 Digital Scrapbooking: Free Kit: It's a Jungle Out There! Free Kit: It's a Jungle Out There! Thank you to Toys 'R Us for the nursery set where I got the characters from! I can't seem to download it, but it seems like a wonderful kit. Can you re-upload it or maybe upload it some place else? sorry, my server is down and hopefully resolved soon, please check back! I would love to use this kit for my sons birthday. Can you help? It will not download. I have tried every kit on you wonderful site and I can't seem to get them to download. sorry, i've now put the file on 4shared.com and it should now work. What an adorable kit--thanks for sharing! we recently visited the zoo, this kit is TOO cute, thanks for keeping it going!! This is adorable! I love all the stitches. Thank you for leaving it up!! Oh, awesome! This is not exactly the bedding set my husband and I have chosen for our baby girl (also from Toys R Us) but it is certainly close! Thanks for having the link up - I'm downloading, and may very well use this for some of our baby album! You are all welcome (sorry this is late!) I'm not sure why you can't open the files, they are either png or jpegs. Is PSP Paint Shop Pro? If so I'm not sure what file types they accept, sorry! Absolutely Awesome! Thank you for sharing your talents. Thank you very much for this! So perfect! All freebies on this blog are for personal use and commercial use but please don't redistribute them in any way. Thank you! Please send me your work using any of these freebies, I'd love to see and share them! Make a Donation if you like my kits! I have downloaded so many free files over the past while, that I thought it was only fair that I supply some myself. I just like making things! So I hope you use these files and enjoy - and if you do, let me know! Gimp - Scrapbooking Software - FREE!